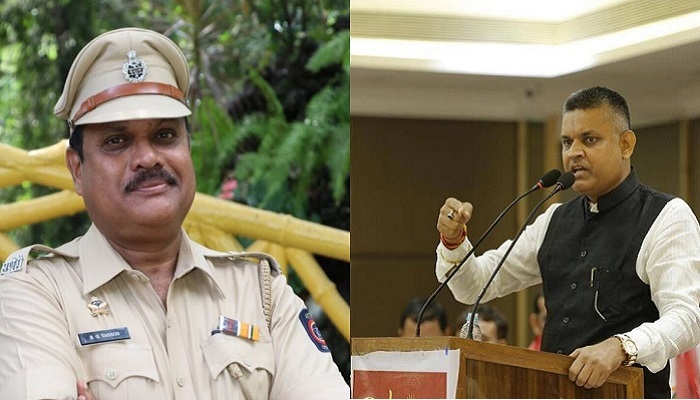 MUMBAI: A well-known social worker and businessman in Mumbai, Amar D. Mishra has complained against retired Additional Superintendent of Police (SP) Bhagwan Yashod and his wife Anita for encroaching on his open land at Wada, district Palghar. This is not shocking that a police officer has encroached on land, given that this happens all the time. But it is indeed shocking that Wada police station incharge Ravindra Naik refused to take action on accused whatsoever and said – “Yashod hamare sahab rah chuke hain. Isliye hum action nahin le sakte.” Naik also claimed that this was a civil matter. Amar D. Mishra, a resident of Malad (West), Mumbai is a well-known social worker, businessman and Chairman of Seven Thoughts Cooperative Credit Society Ltd. Last month Mishra complained (Copy available with ABI) to several authorities as well Prime Minister Narendra Modi, Chief Minister Devendra Fadnavis and Director General of Police, Maharashtra, Sarpanch, Group Gram Panchayat, Suponde, Taluka Wada, demanding action against Bhagwan Yashod, Punit Yashod, Anita Yashod, Kanchan Kesrinath Patil, Praful Kesrinath Patil, Jayesh Chaudhary and Sudhir Sudhakar Patil. Bhagwan Yashod is a resident of C/1704, Internity Complex, Teen Hath Naka, Thane (West) and retired additional SP from Palghar district. According to the complaint, Mishra has two acres of plot valued at Rs. one crore rupees situated at Kumdal village, Suponde gram panchayat, Taluka Wada, District Palghar. Few months back Mishra was passing by his plot and was shocked to see that few labourers were constructing something on his land. They completely removed 110 cement poles and barbed wired fenced by Mishra. They also burnt the green trees on the plot. After inquiry the labourers informed that they were working on the instance of the local contractor Jayesh Chaudhary and Sudhir Patil. Mishra spoke to Jayesh Chaudhary. Chaudhary informed that plot belongs to Bhagwan Yashod and suggested to keep away from the plot. On second day Mishra met Ravindra Naik, Senior Inspector of Wada police station complaining against encroachment on his land. Naik called an accused Sudhir Patil in police station. After discussing with Sudhir Patil, Naik said, “Ye Bhagwan Yashod hamare officer rah chuke hain to main inka kaam nahi rok sakta aur aise bhi ye civil case hai, aap court se stay le lo”. “Main Wada police station ke Sr Inspector Ravindra Patil se mila. Patil ne mujhse kaha ki, “Bhagwan Yashod hamare sahab rah chuke hain isliye main koi action nahin le sakta,” said Mishra. A few days later, Mishra visited his land once again. As he got down from his car, few goondas with bamboo sticks, iron rods restricted him for entering his plot. They abused and threatened him saying if he dared to enter on this land, they will cut his legs as their boss Bhagwan Yashod was police officer. Mishra escaped from the spot feeling apprehension and danger to his life. “I have complained to several authorities demanding action on Bhagwan Yashod and other accused as well as Ravindra Naik. Offence of criminal trespass, abusing, threatening for dire consequences and more sections should be registered against the accused,” said Mishra.